Dear readers, I took full advantage of this holiday weekend to get away to the deep white north of Essex Junction, Vermont. With the exception of watching Knight and Day (which was surprisingly fun), I shut myself off to the outside world, meaning I don't have much new to offer you for a Magical Monday Moment. But how about a little flashback....? The infectious "Cup of Life" by Ricky Martin came up on my epic "Road Trip Mix," bringing back the amazing memory of watching a relatively unknown Latino singer burst onto the stage of the 1999 Grammy Awards. Oh, Ricky. 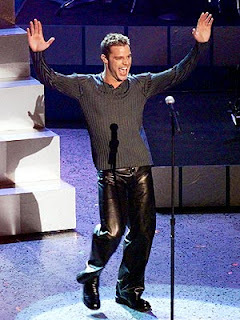 Those leather pants will always bring a smile to my face!